The leaves are starting to change and the temperatures are starting to drop which can only mean one thing: fall is upon us. Fall is one of the best seasons to enjoy homemade baked goods and Italian Bakery does not disappoint. The Italian Bakery offers a variety of seasonal specialties through the autumn months all of which offer the familiar tastes of fall. A twist on the original sugared doughnut, this sweet snack goes well with a cup of coffee, or even better, with a group of friends. Bring a batch of them to your next fall picnic or seasonal party today! These are two of our all-time favorite cakes: a pumpkin cake and carrot cake, finished with cream cheese. The cream cheese frosting gives the cake a sweet, delectable taste, that anyone can enjoy on these seasonal favorites. And what would fall be without the sweet taste of fresh, seasonal apples? 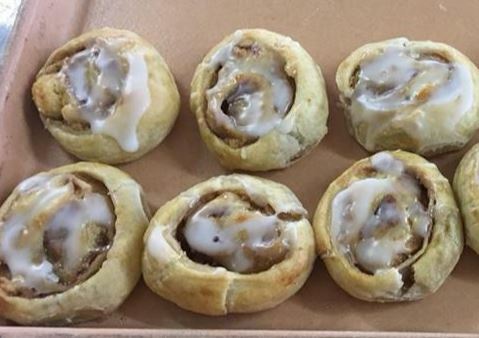 Our apple nests are pastries that are layered with an irresistible cinnamon and apple swirl, perfect for any occasion. Our apple strudel has a flaky dough that covers sugared apple slices in a combination that has been delighting customers for generations. At the Italian Bakery, we offer a “take and bake” version of this timeless classic, which allows you to take the strudel home frozen and bake it at your own convenience, filling your home with sweet scents of fall. It’s perfect for a last-minute dessert idea if you’re unexpectedly invited somewhere. Please keep in mind that these must be ordered in advance if you’re hoping to have an apple strudel on hand. All Italian Bakery’s pastries are made by scratch with the freshest ingredients. Today, our customers keep coming back for a taste of our world-famous potica, our Italian fruit cake, our crisp, crunchy biscotti, and a variety of other delectable pastries including our fall favorites.